We’re swinging ever closer to the release date of Spider-Man: Homecoming, the much-anticipated first Spidey solo movie to come from the unprecedented deal between Marvel Studios and Sony. With only a couple of months left to go now before it arrives, the studio is continuing to tease us with new promotional material and the latest arrives in the form of a few stills, which you can see below. 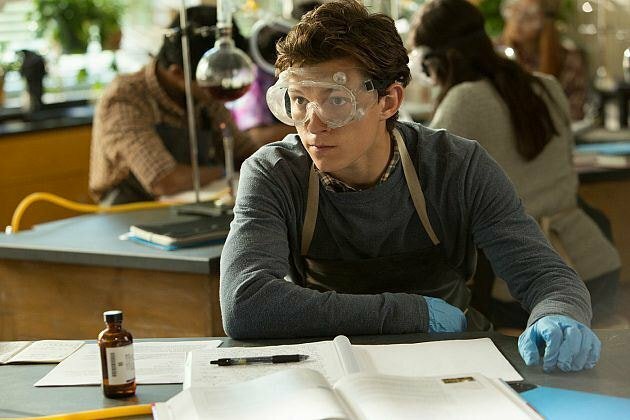 We say tease because this set of images hold off on the Spider-Man-centric part of the movie and instead highlight Peter Parker’s high school life. Specifically, we have a shot of Peter (Tom Holland) and his best friend Ned Leeds (Jacob Batalon) in the school hallway, one of Peter getting stuck into some classroom science and another one of him skulking through the deserted halls with Ned looking shocked to the side. Lastly, the fourth image spotlights Peter and Liz Allen (Laura Harrier), as they look to be getting close. The high school setting is being marketed as the USP of Spider-Man: Homecoming. While both 2002’s Spider-Man and 2012’s The Amazing Spider-Man also featured Peter Parker attending classes, Homecoming has been talked about as a proper coming-of-age drama mixed with superhero action. In fact, director Jon Watts has previously spoken about how he wanted it to be like a “John Hughes movie,” referencing the director of 80s teen classics like The Breakfast Club. Spider-Man: Homecoming stars a packed cast of young talent (Tom Holland, Zendaya, Laura Harrier, Jacob Batalon, Angourie Rice, Tony Revolori) and established actors (Robert Downey Jr., Michael Keaton, Marisa Tomei, Donald Glover, Bookeem Woodbine, Logan Marshall-Green, Martin Starr). It marks Jon Watts’ Marvel directing debut and is set to swing into cinemas on July 7th.